3M Glass Cleaner and Protector with Scotchgard Protection leaves an invisible layer of protection on glass and uncoated granite, ceramic and porcelain, making these surfaces easier to clean after routine use. Scotchgard Protection also helps reduce fogging on windows and mirrors with repeated use, leaving glass with an attractive shine. Also cleans (but may not protect) other hard surfaces like stainless steel, chrome, aluminum, ceramic, plastic, acrylic plastic, desks, walls and other common nonporous surfaces. 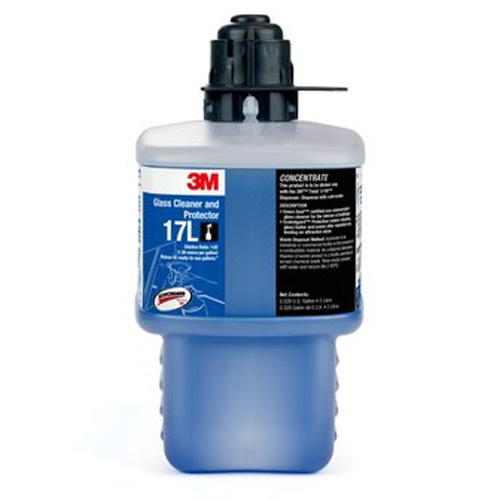 This versatile cleaner removes dirt, greases and oils from hard washable surfaces. Not for use on direct food contact surfaces, vehicles, inside aquariums, eyewear or porous surfaces. Formula has less than 0.1% VOC in diluted, ready-to-use format through 3M. Twist ‘n Fill Chemical Management System. Green Seal GS-37 certified in 3M Twist ‘n Fill format, as a glass and multi-purpose cleaner. US patent pending. Each 2 liter bottle of concentrate yields 42 ready-to-use gallons.